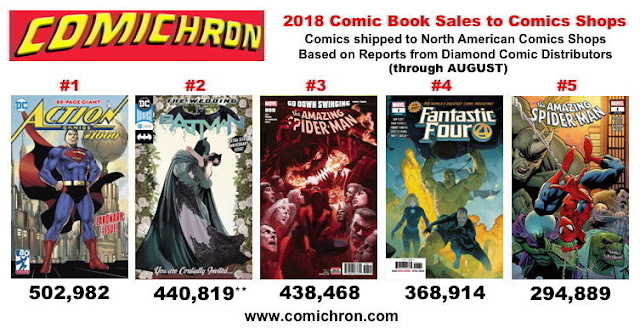 Marvel's First Family returned in August, with nearly 369,000 copies of Fantastic Four #1 shipping to retailers in the United States and Canada. Click to see our comics sales estimates for August 2018. As reported here on Friday, August was a fourth growth month out of five, despite a dearth of new comics releases. Comics dollar sales were up 5% and units were down 5% in a five-week month that saw 11% fewer new comics released than the same month in the previous year. August 2017 was one of the most disappointing months of the comics recession that year, so a rebound was welcome. Graphic novels were also up, thanks to significant deep-discount sales; it was just the second month both comics and graphic novels were up since 2016. Marvel's Fresh Start relaunch mostly past, the month saw only three comics selling over 100,000 copies. 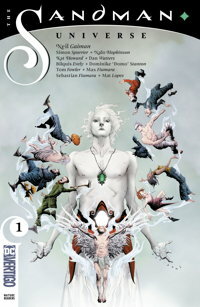 But DC saw a strong launch for Sandman Universe #1, placing third in dollars and sixth in units with more than 83,500 copies shipped to the United States and Canada, a large number for a Vertigo launch. 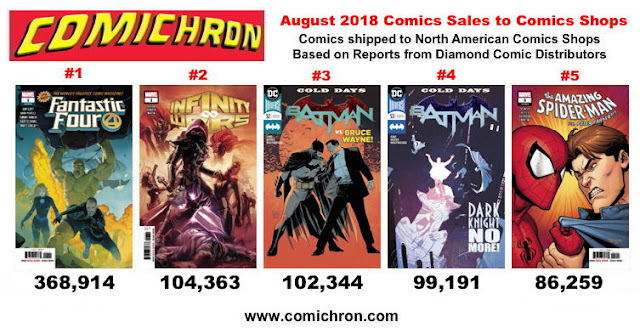 Batman #50 did not chart again, despite having led the comics reorder charts twice in July. The comic book was made retroactively returnable. You can see the year-to-date bestsellers here; we've doubled the length of both the comics and graphic novel charts to 200 items each. The first two-thirds of the year closed down 1.1%, but prospects for a slight year-over-year improvement remain good.